She’s a shy woman from Charlotte. 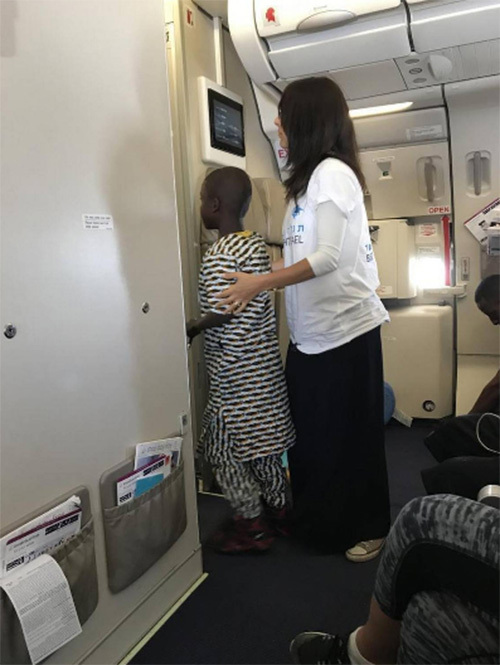 He’s a little boy, apparently African, who was screaming aboard a transatlantic flight. Their encounter between Brussels and New York made the eight-hour flight go easier for their fellow passengers. The virtually wordless connection – neither spoke the others’ language – also offered a lesson in compassion that has circulated widely online. “I’m the type of person who would let somebody step on my foot for like a half- hour before I would say something,” 33-year-old Rochel Grone said. But about an hour into the flight, Groner heard sounds of distress behind her. Groner and her husband run Friendship Circle, which pairs teen volunteers with children with special needs such as autism. As the wailing continued, tension mounted. Sleeping passengers woke up, startled by the noise. After 15 minutes, Rochel Groner could sit still no longer. Groner got out of her seat. She asked for a pen from a flight attendant, grabbed a nausea bag and threaded her way down the aisle. Groner put her hand out. The boy looked at her, stopped his wailing, and took it. They walked into the aisle and plopped down together on the floor near an emergency exit. Groner doodled on the nausea bag, tracing the outline of her hand as the boy watched, absorbed. Groner talked and smiled at him, and grabbed more nausea bags. At one point, the boy traced his own hand. So it went for another hour or two. A travel pillow, some orange juice and cookies helped calm the child. The boy spun a fidget spinner and held it to his cheek, soothed by its rhythm. He even smiled and laughed. The rest of the trip went smoothly, Groner said, although one crew member suggested to her husband that she didn’t need to intervene. Another attendant thanked her after the flight, and so did several passengers. The boy’s mother, in a few words of English, also thanked Groner. She did not get their names. Groner believes God put her on the flight.